Thorskogs Slott is a grand manor house or castle that was built by Shipyard Magnate Petter Larson in 1892. Today, it is an elegant host to weddings, conferences and travelers looking for a unique destination with an impeccable restaurant. 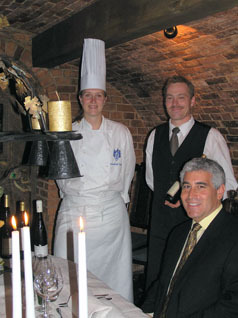 In late August 2005, Edward F. Nesta and I stayed at Thorskogs Slott and experienced their gourmet restaurant, which participates in Vastsvensk Mersmak or Taste of Sweden, a special program that was launched in 2000, to help promote tourism to West Sweden as a culinary destination. The program is open to restaurants outside of Gothenburg, who must pass a rigorous training program, as well as be judged by a jury to determine if they uphold the high standards that Västsvensk Mersmak strives to meet. We had a wine tasting dinner with their chef Anna Sara Johansson, in a private dining room in their wine cellar, where the white damask tablecloth was sprinkled with wine corks, and the floral arrangement was a fanciful mix of peacock feathers, seed pods, ears of corn, rocks and glass leaves in a metal dish. Christar, our server, began our evening with an aperitif of champagne and an amuse bouche of fish mixed with eggs and served on brown bread, accompanied by an assortment of homemade sourdough bread with sun-dried tomatoes, foccacia with black olives and a delightful nutty brown bread, that was our favorite. Our first course of our tasting menu was a delicate Jerusalem Artichoke Soup with Tartar of Salmon drizzled with drops of herb oil followed, paired with a 2000 Marc Tempé Zellenberg Pinot Blanc from Alsace, France, with 13% alcohol, which had an aromatic citrus nose, that was full and rich on the palate, with citrus and floral notes. For our second course, we had Smoked Reindeer with Rosemary Polenta and Horseradish Cream, which was paired with a 2000 Marc Tempé Saint Hippolyte Riesling, from Alsace, France with 12% alcohol. 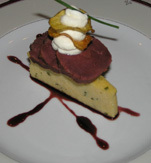 The restaurant smokes its’ own reindeer, and this dish was presented with a reduction of port wine sauce, almond potato crisps layered with dollops of horseradish cream and stacked on a wedge of creamy polenta rich with herbs and cheese. The wine had a sweet nose with a hint of vanilla and honey on the palate. Edward selected the tender Veal with a Puree of Potato and Parsnips and Fresh Butter-fried Chanterelles for his third course, which was paired with a 2001 Château Tire Pé La Côte from Bordeaux, France with 13.5% alcohol that was lightly aromatic with earthy notes. I selected the Red Spotted Sole with Green Pea Sauce, for my third course, which was paired with a full-bodied 2001 Domaine Patrick Javillier “Cuvee des Forgets”, Bourgogne, France, with 13 % alcohol, with rich fresh apples and hint of spice on the nose, with ripe pears and apples, and a nice balance of acidity on the palate. The sole was topped with crispy chanterelles sautéed in butter and sprinkled with sea salt, along with a pea puree. For our dessert course, we sampled a light Cardamom Pannacotta with Apple Gravy and buttery almond biscotti, and plums from their own trees that were marinated in rum, served with fresh whipped cream and garnished with a mint leaf, which were paired with a 2001 Château Pierre Bire ‘L’anclaire’ Coteaux du Lyon Beaulieu, with 13% alcohol, which had a classic nose of citrus and honey, that was also present on the palate. Read other articles on Thorskogs Slott in the Hotels & Resorts and Chefs’ Recipes sections, where Chef Anna Sara Johansson shares a few of her special recipes. Please read other articles on Sweden in our Destinations, Hotels & Resorts, Chefs’ Recipes, Restaurants, Music Scene, Gastronomy, Liquor Cabinet and Events sections. For more information on Sweden, please visit: www.visit-sweden.com, www.west-sweden.com and www.vastsvenskmersmak.com. © February 2006. Luxury Experience. www.LuxuryExperience.com. All rights reserved.